The man from The New York Times did what men from the New York Times always do -- he asked a very long question on Tuesday. The question, about attracting golfers to Northern Ireland in the wake of recent major success stories, was addressed to man of the moment Darren Clarke. The venue was the Dunluce Room in the Royal Portrush golf club, a venue that is now the proud home to the first Irish winner of a major -- Fred Daly at Hoylake in 1947 -- and the last – Darren Clarke at Royal St. George’s last Sunday. Coming just four weeks after Rory McIlroy’s brilliant U.S. Open win at Congressional, and a year and four weeks after Graeme McDowell’s triumph at Pebble Beach, it was a very fair question from a man who had traveled a long way to join the rest of us for Clarke’s homecoming. The answer was quite brilliant from this son of Dungannon, a man who moved to Portrush as a 17-year-old with his family to further his own golf career on one of the greatest links in the world, and a man who moved back to these parts with his own two sons Conor and Tyrone a year ago last week. “The night that Rory McIlroy won the U.S. Open there were riots in parts of Belfast and they were images that went all across the world,” replied Clarke as he took up the role of ambassador for all things Irish. Again. “But let me tell you that if you come to Northern Ireland to play golf you will meet a lot of very friendly and hospitable people who will want to make you feel welcome and want to share our wonderful golf courses with you. “I can promise you that 99.9% of all people in Ireland are decent and friendly and welcoming and honest people. A few give us a bad name, but please don’t let them put you off coming here. The man from The New York Times seemed suitably impressed -- and satisfied -- with Clarke’s answer, but it was like that all afternoon on Tuesday as the 42-year-old fielded all questions with ease at the reception in his honor. The drive up to Portrush and the presence of some of those there to honor Clarke told its own story and proved, once again, that sport really can bring people together. A few miles outside Portrush lies the village of Ballybogey, a well known sight to many American tourists on their way to the Bushmills whiskey distillery in Antrim and the world famous Giant’s Causeway that attracts so many visitors each year. Ballybogey is a typical village for this part of the world, adorned with the Union Jacks and the Red Hand flags that leave you in no doubt as to the political aspirations of the locals. Royal Portrush, as its name suggests, is a golf club with allegiances to its own roots. Photos of the U.K.’s royal family adorn the walls, and it is the only course in Ireland to have hosted the British Open, four years after Fred Daly’s historic 1947 victory. Yet Portrush also represents a wonderful example of golf’s ability to fly the flag for Irish sport as a means to bringing people together. On Tuesday afternoon, the government of Northern Ireland was represented at the Darren Clarke ceremony by one Martin McGuinness, a man whose own Republican background is far removed from the Union Jacks of Ballybogey and surrounding areas. McGuinness, as McIlroy discovered on a recent visit to Stormont with the U.S. Open trophy in hand, is no golfer. He nearly hit one of his secretaries with a golf club as McIlroy tried to teach him how to hit a seven iron in the grounds of the Northern Irish Parliament buildings. McGuinness is, however, a realist. He knows the value of these recent major wins to the North’s economy, he knows the marketing value presented by McDowell, McIlroy and now Clarke as their winning smiles were beamed across the world. So when Darren Clarke, among many others, renewed calls for Portrush to once again host the British Open in the wake of his own Claret Jug success, McGuinness was happy to back the call. McGuinness, deputy first minister in the Northern Irish government, went one further with an idea that also has the backing of Clarke, whose first professional outing post-Sandwich will be in Killarney next week for the Irish Open. Portrush may well host the British Open again, but that possibility is at least five years away as the next five venues are already chosen. In the meantime the Irish Open, without a sponsor despite the presence of four Irish major winners in next week’s field, may cross the border and pitch its tent on the Antrim shoreline. Clarke thinks it’s a good idea and McGuinness promised, in the clubhouse of one of the world’s great royal approved golf courses, to do his utmost to make it happen. I believe we will see an Irish Open at Royal Portrush. And it will be a great Irish Open on one of the greatest courses you will ever get a chance to see. Fred Daly and Darren Clarke deserve that much. Their club deserves it. Irish golf deserves. So the message to Martin McGuinness and Enda Kenny and all the other politicians who were quick to praise Clarke this week is a simple one – just do it. 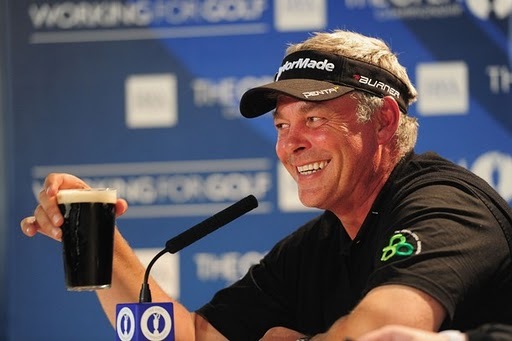 GOLF: Interesting that the minute Darren Clarke walked through the door of the Dunluce Room in Royal Portrush on Tuesday afternoon, the bar opened. Clarke has closed a few bars late at night since winning the British Open, but promises to be well over the celebrations by the time the Irish Open and U.S. PGA events come along in the next couple of weeks. “I’ll have sobered up by then,” he joked. GOLF: Nice touch from Padraig Harrington at the British Open when he wore a special fundraising hat in honor of a Wilson employee currently fighting cancer. Harry’s hat caused a lot of debate in the press tent, but he made it perfectly clear why he was wearing it -- and why he would continue to wear it as the man who works with one of Padraig’s sponsors fights for his life. SOCCER: Congratulations to Shamrock Rovers, who made it through to the next round of the Champions League qualifiers with a scoreless draw away to Flora Tallinn on Tuesday night to record a 1-0 aggregate win. The victory is worth over half a million Euro to Rovers no matter what happens in the next round against FC Copenhagen of Denmark and a real fillip for the domestic game back home. GOLF: Great tweet from Graeme McDowell when Darren Clarke won the British Open title at Sandwich on Sunday afternoon. “Darren’s just become the first Ulster golfer to win a major …. in four weeks!” tweeted McDowell. Brilliant. CYCLING: Our own Nicolas Roche is down to 22nd in the Tour de France after losing more ground in Tuesday’s stage, but his column in the Irish Independent is still worth reading. Maybe even more so as his frustrations grow by the day. GOLF: Word has it that Rory McIlroy has taken up with the world tennis number one Caroline Wozniacki. That may explain why he visited Wimbledon not once but twice after his U.S. Open win. Can’t say I blame him by the way. SOCCER: Manchester United boss Alex Ferguson has accused Sunderland of moving the goalposts in their bid to sign Darron Gibson. Having seen some of Gibson’s shooting of late, moving the goalposts is probably a good idea! A friend who knows Darren Clarke well -- and a long time -- admitted the Ulsterman had his head up his own rear end when he first turned pro. Clarke himself admitted to being a moody so and so in the past at Royal Portrush on Tuesday. But anybody who witnessed his faultless charge to the British Open title on Sunday can only have been impressed by his calm demeanor. His tribute to his boys Conor and Tyrone and his late wife Heather afterwards proved he is now a man who knows exactly where he is going -- and values it. The former Ryder Cup captain Mark James insulted the people of Northern Ireland on Sunday and shouldn’t be allowed to get away with it when he was asked to comment on the incredible recent success of Graeme McDowell, Rory McIlroy and now Darren Clarke. “Maybe they’ll stop fighting each other,” was essentially what James said when asked for his response on live television to all this Northern Ireland glory. Idiot.